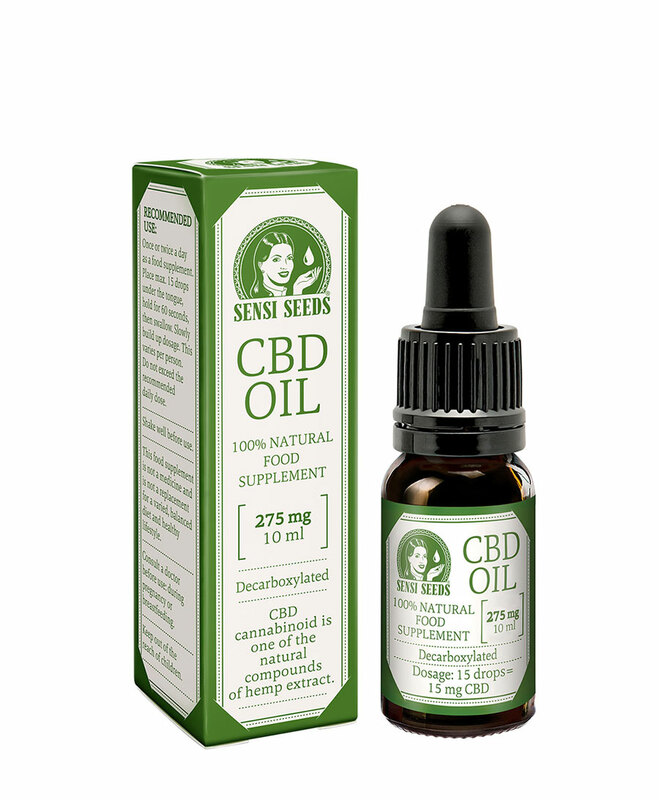 One bottle of 10ml Sensi Seeds CBD Oil contains 275mg of CBD (cannabidiol). This extract is made from hemp plants grown within the European Union, without the use of pesticides or herbicides, in order to produce a safe product of the highest quality. Sensi Seeds CBD Oil contains different phytocannabinoids, the most well-known being CBD, CBC (cannabichromene), CBG (cannabigerol), and CBN (cannabinol). It also contains terpenes, including Myrcene, Limonene, Alpha & Beta -pinene, Linalool, B-caryophyllene, Caryophyllene oxide, Humulene, Nerolidol and Phytol. 275mg CBD Oil (10ml) is added to your shoppingcart! 275mg CBD Oil (10ml) is added to your wishlist!